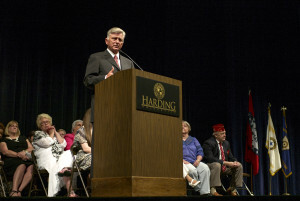 Arkansas Governor Mike Beebe addressed the 71st session of Arkansas Girls State at Harding University May 29. This was the University’s 23rd year to host the event. Girls State is a program created by the American Legion Auxiliary Department of Arkansas to allow high school juniors to participate in hands-on citizenship training. Upon reaching the podium, Beebe asked for the Girls State participants representing the Federalists to identify themselves, followed by the Nationalists. Each group cheered. But when he asked who among them were Arkansans, the auditorium erupted with shouts of joy and pride. High school juniors throughout Arkansas are selected each year for their interest in government, honesty, leadership ability and good character. Nearly 900 girls from across the state arrived on campus May 26 to spend the week learning elements of government by establishing an imaginary state and holding elections of public officials on local, county and state levels. They then carried out the duties of each respective public office. Students had the opportunity to perform in the Girls State Choir, under the direction of Craig Jones, choral director at Harding Academy, and Girls State Band, under the direction of Trey Reely, band director at Riverview High School. For more information about Girls State, contact the American Legion Auxiliary Department of Arkansas office at 501-374-5836. Harding is the largest private university in Arkansas and attracts more National Merit Scholars than any other private university in the state. Harding also maintains campuses in Australia, Chile, England, France, Greece and Zambia.